The assembly was held in a follow-up to the congress by the ruling Workers' Party of Korea in May, a venue which analysts say served as a coronation for the North's leader who took power in late 2011 following the sudden death of his father Kim Jong-il. At the first party congress in 36 years, Kim was elected as the WPK's chairman, replacing his previous title of the party's first secretary. Wearing a Mao-style suit, Kim attended the parliamentary meeting where the communist country revised its Constitution and replaced the National Defense Commission with the commission on state affairs, according to the broadcaster. Previously, Kim was the first chairman of the NDC. The NDC served as a powerful state organization under the Kim Jong-il regime which advocated a military first, or "songun," policy. But the current leader has shifted his focus to the ruling party while sticking to nuclear weapons development. "With the new state title, the North's current leader will likely cement one-man rule at a similar level to the absolute power enjoyed by his late father and grandfather," said Cheong Seong-chang, a senior researcher at the Sejong Institute. Yang Moo-jin, a professor at the University of North Korean Studies, said that the new organ seems to have an expanded role of handling inter-Korean affairs, diplomacy and security. The assembly usually convenes in April, attended by hundreds of deputies, to finalize the country's budget spending and overhaul Cabinet organs. But the North held a smaller meeting in late March ahead of the party congress. At the parliamentary meeting, North Korea reaffirmed its commitment to developing nuclear weapons in tandem with boosting the country's moribund economy, commonly known as the "byeongjin" policy. At the party congress, the North's leader has made it clear that he will "permanently" defend his signature dual-track policy. Seoul and Washington have warned that the dual-track policy is a dead end. 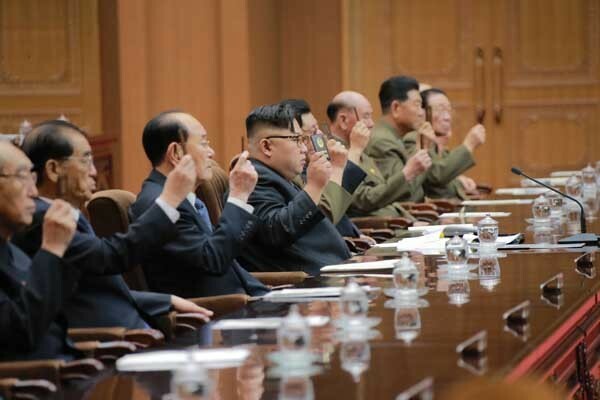 The U.N. Security Council slapped tougher sanctions on North Korea in March for its fourth nuclear test in January and long-range rocket launch in the following month. Last week, the North claimed that it has successful launched an intermediate-range ballistic missile, saying that it has the capacity to strike U.S. forces in the Pacific region. At the assembly, North Korea appointed three key figures of the military, the party and the Cabinet as the vice chairmen of the state affairs commission -- Hwang Pyong-so, director of the general political bureau of North Korea's armed forces; Choe Ryong-hae, a vice chairman of the party's central committee; and premier Pak. The North vowed to accomplish the five-year strategy to boost the economy which the North's leader unveiled at the party congress, but its detailed action plans were not unveiled at the parliamentary session. "The five-year strategy aims to improve the livelihood of North Koreans and lay the groundwork for developing the economy in a sustainable way," Pak said.